NGC 6960 is the Western part of the Veil Nebula - a supernova remnant that spans 3 degrees in the constellation of Cygnus. 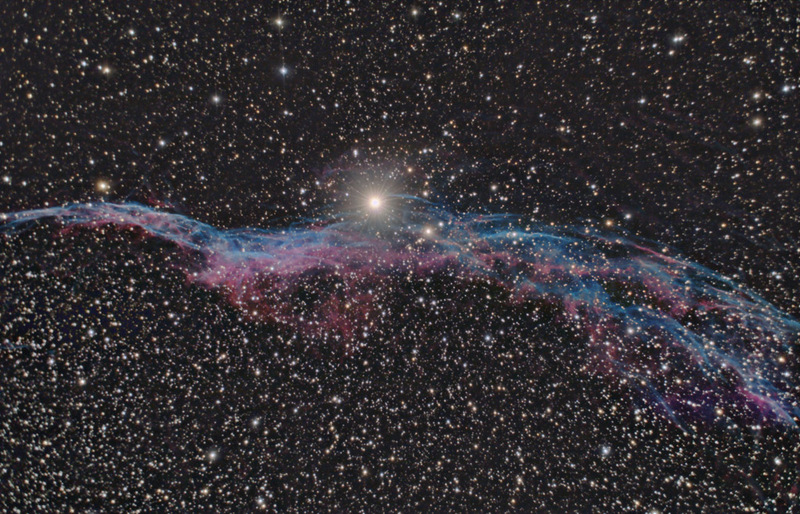 NGC 6960 is known as the "Witch's Broom" as well as the "Filamentary Nebula". This portion of the Veil Nebula appears to pass through the bright 4th magnitude binary star, 52 Cygni. This image shows about 1 degree of NGC 6960's approximately 1 1/2 degrees. Software Used Images Plus 4.0 for camera control, calibration, stacking and digital development. Photoshop CS5 used for flat fielding, curves, color correction, saturation adjustments, star shrinking, noise reduction, and high pass filter. HLVG for additional color correction, Carboni Actions for additional saturation adjustments and noise reduction. Notes This image was very difficult to process, primarily due to a gradient problem I've been having with my camera. I was able to capture some good detail, but the result is a bit less than I had wanted, particularly given the many hours of imaging I put into it.